We reviewed their sister company Time4VPS in our last review. This would be a great way to compare both hosting providers. Hostens has similar origins with Time4VPS – they both branched out from “Interneto Vizija”, which was founded in 2003. All their team members have years of experience, which makes their support team fast and helpful. The team members and their experience is what makes them stand apart. 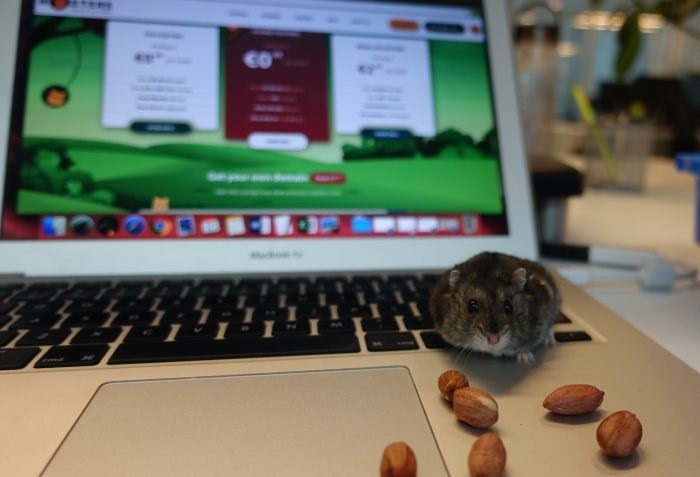 The one thing you’ll notice throughout their site is their cute hamster. Not really related to web hosting or their services, but it’s still a nice touch. It’s fun to see something different aside from all the usual, generic web hosting site designs and branding. You can read more about Hostens and their data center in their About us page. Their shared web hosting plans have everything you’d expect in a shared hosting plan. cPanel, PHP 7.3, automatic backups, FTP access, emails etc. We’ll review their cheapest (Value) shared hosting plan, which is only $1.99 per month, or $0.99 if you go with a longer billing cycle. They use cPanel, it’s likely that you’ve already used cPanel before. You can set up a free SSL (Let’s Encrypt) and use a 1-click installer (Installatrion). You can use the 1-click installer to install apps like WordPress, Magento, and more. Just as a simple test and a benchmark, we installed WordPress using the 1-click installer. We didn’t configure or change anything. When you install WordPress using Installatrion, you can configure automatic plugins and themes updates. It’s a great option to have if you plan on using it. You can also configure automatic backups (daily, weekly, monthly etc), and everything is done with a few clicks. What we like most about their shared hosting plans is the price and features you get for that price range. You rarely get good support and fast servers for that kind of pricing, which is why Hostens is a great find. If you like Time4VPS and need a shared hosting plan, Hostens would be a great choice, since Time4VPS don’t offer shared hosting. As per usual, we’ll do a simple speed test on a default WordPress installation. We’ll use the same test setup as we did for our WordPress hosting tests so there’s something to compare. The homepage fully loaded in 0.723 seconds. A better result than most of our other tests. They offer 3 kinds of unmanaged VPS plans: “normal” VPS plans, container VPS, and storage VPS plans. We’ll review their cheapest normal VPS plan. It’s an unmanaged (self-managed) plan after all, so there’s not much to expect here. You’ll have to do most of the work yourself. The pricing is still cheap, even when compared to other self-managed VPS providers. They’re pretty solid, considering it’s their cheapest plan. The VPS control panel is pretty simple – offers features that you can use to reinstall the OS, change your password, log into your server via a web console, reboot your server etc. All the basics you need. If you’re a beginner, it’s worth mentioning that these plans may not be a good fit for you. Go through our choosing guide to find out what kind of a hosting plan will suit you better. There’s not much to review when it comes to their other services (VPNs, SSLs, Domains), so we won’t review those. For the VPN plans, they have server locations in the US, EU, and Asia. Not a lot of options when it comes to domains (TLDs) though. The 24/7 support team is helpful and fast to respond. Live chat requests get answered in seconds. Their sysadmins are experienced and have years of experience. The price for the kind of services and features they offer is hard to find these days. They’re petty cheap as-is, but if you use a longer billing cycle or a coupon they’re even cheaper. With the 30-day money-back guarantee you can try them out, and if you don’t like them, you get your money back. This is pretty standard with hosting providers, but still a great option to have. You can use multiple payment methods, including Bitcoins/Bitcoin Cash aside from the usual like a credit card or PayPal. They don’t offer DDoS protection with their hosting plans. Though you’re free to use an external one. When your VPS gets attacked, it will be shut down. The process is explained here. They only have a few TLD choices, but that’s not even a downside. They’re not a domain provider and we don’t expect them to have 300+ TLDs like others do. They’re cheap. The support team is great. The features and quality you get with all their hosting plans are great, especially considering the price. We encourage you to try them out, you won’t be disappointed. Leave a review below after you do.